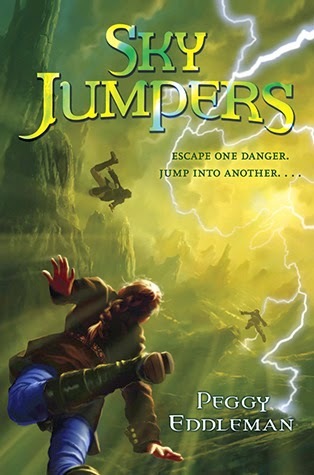 Peggy Eddleman's Sky Jumpers was a great find among the 2013 Whitney Award finalists. Set in a post-apocalyptic world, the book features Hope, a strong, brave, risk-taking eleven-year-old, who is troubled because her talents don't lie in the area most highly prized by her community. Sky Jumpers does an excellent job of world-building. World War III finally happened. A couple generations ago, a dictator named General Shadel began invading neighboring countries, other countries started picking sides, and millions of people were killed. Nuclear bombs had been outlawed worldwide years before, but the United States started developing a "green bomb" that was thought to be less devastating than an atomic bomb. General Shadel's scientists developed their own green bombs and then Shadel launched them at his enemies, who retaliated. And the world as they knew it was destroyed. Hope's home, White Rock, is an oasis of peace and plenty surrounded by a dismal and dangerous world. White Rock is a small town built in the bowl of a crater left by the devastating explosion of one of the green bombs. Bands of bandits and thieves roam the countryside attacking settlements and stealing precious food and supplies, but the idyllic White Rock is protected by a lethal band of compressed air called "Bomb's Breath", a residual effect of the green bomb. Consequently, White Rock has become fairly prosperous by comparison, and its citizens have been able to recreate many inventions that were destroyed in World War III. This re-invention process is made more difficult by the fact that the side effects from the green bombs fundamentally changed the world. "Besides new plants, metal having different properties, weather patterns changing, and the existence of the Bomb's Breath, the green bombs destroyed any ability to create a stable magnet. No magnets meant no electric motors...no matter what we did, we'd never get back to the technology level that existed before the bombs." Everyone in White Rock is expected to invent, to work on creating devices or methods to make life easier, but Hope is a dismal failure. None of her inventions work right, a fact that is doubly embarrassing since her father is one of the town's leaders. However, when the bandits discover how to circumvent the Bomb's Breath and hold the town hostage for their precious antibiotics, it's up to Hope to go for help and save the day. I love that Hope discovers her strengths as the story goes along, or rather she discovers that her strengths are just as valuable as anyone else's. "I realized that I'd been trying to contribute to my town by using my biggest weakness, just because it was how everyone else contributed. I should have been using my biggest strength." She gains confidence in her abilities as a leader and draws strength from the love she has for family and friends. Sky Jumpers is the first in a planned series, but works really well as a stand-alone novel. Occasionally Eddleman's prose dips a bit into didactic territory - sometimes she "told" the readers about characters and lessons learned rather than "showing" us - but on the whole there's a good balance of action-packed scenes and internal conflict.